Suzuki’s DF150AP outboard has been chosen as a 2015 ‘Top Product’ by US marine industrial news magazine, Boating Industry. Suzuki Selective Rotation, the world’s first technology that enables switching of gearshift mode of regular rotation and direction of propeller rotation into counter rotation, is adopted for the first time in their class. Upon installing two or more outboards onto a boat, the outboard can be switched into a counter rotation model just by changing gearshift mode and installing counter rotation propeller*1. *1:Consult with your dealer before changing Standard Rotation to Counter-Rotation (or vice versa). The optional connector and additional propeller are needed to change the outboards rotation. Precise throttle controls with smoother, decisive shifting is realized by adopting Suzuki Precision Control, a technologically advanced computer based control system that replaces the mechanical control cables found in conventional control systems with electronic wiring that eliminates the source of friction and resistance. When combined with Suzuki’s Lean Burn Control System it realizes improvement in fuel economy over a wide operating range from low-speed to cruising. Suzuki’s “Big Block” in-line four-cylinder engine utilizes a large 2,867cm3 displacement and high compression ratio to generate 129.0kW (175PS) and 110.0kW (150PS) for impressive acceleration and low-end torque. The new DF175AP/150AP development team based both of these new Suzuki outboards on a big block inline four-cylinder four-stroke engine with a 2,867cm3 displacement. The block is topped with a DOHC powerhead that provides four-valves per cylinder for high performance. While the large displacement allows both to deliver exceptional acceleration and velocity, our engineers made sure that the outboard’s final dimensions are as compact and lightweight as possible. Both outboards feature some of the best of Suzuki’s advanced technologies that have been developed to extend engine performance. Compression and displacement each play important roles in delivering performance and power output. Displacement has a direct effect on acceleration and torque so a bigger displacement is generally going to deliver more of both. Higher compression ratios allow the engine to get more output out of the combustion process resulting in noticeable improvements in performance and power. 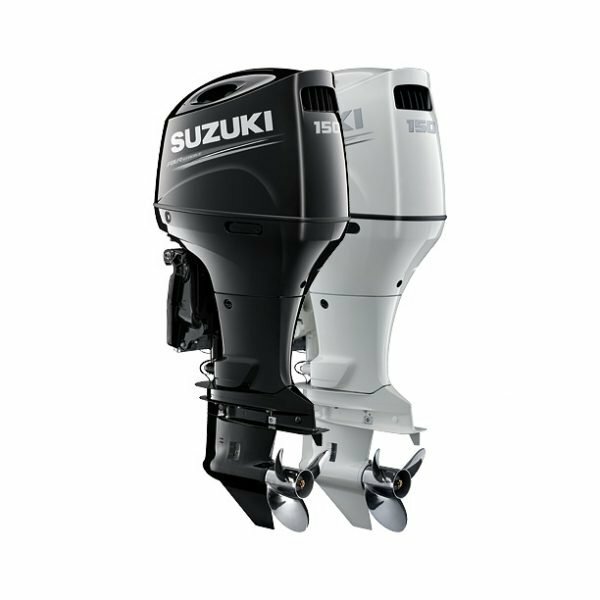 Drawing on our extensive motorsports experience and expertise in building race engines, Suzuki engineers have combined a 2,867cm3displacement (the largest in each outboard’s class) with a high compression ratio of 10.2:1 to obtain great performance from these compact engines. Underneath the modern upswept engine cover are a number of function-focused features that enhance engine performance. Both the DF175AP and DF150AP are equipped with a Semi-Direct Air Intake system that brings cooler air directly into the multi-stage induction module. Engines that breathe cooler air can operate more efficiently resulting in greater acceleration and top-end speed. Covers also have ports on the top that allow the rotating flywheel to push warm air inside of the cover to the outside helping to reduce temperature inside of the cover. Large boats equipped with multi-outboard installations generally pair a standard rotation outboard with a counter-rotation model to keep the boat traveling in a straight line and on an even keel. 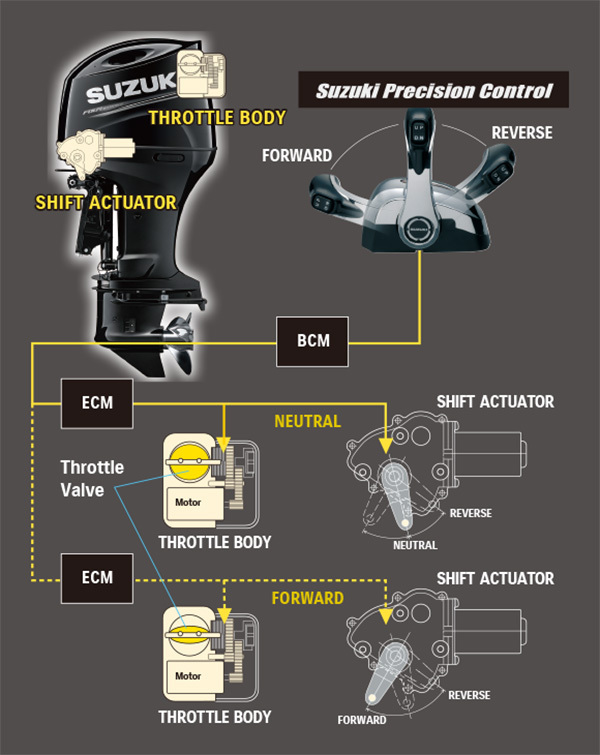 Once requiring the purchase of a dedicated counter-rotation model, Suzuki’s innovative Suzuki Selective Rotation eliminates that need by incorporating a special, unified design of gears, shaft, and bearings in the lower unit that allow the outboard to operate reliably and efficiently in either direction. Available on both the DF175AP and DF150AP, counter-rotation operation requires an optional activation switch that connects to a circuit inside of the engine compartment plus the installation of a counter-rotation propeller*1. 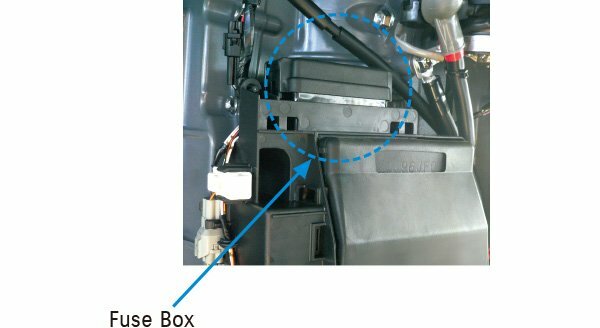 Suzuki Precision Control is a technologically advanced computer-based control system that replaces the mechanical control cables found in conventional control systems with electronic wiring that eliminates the source of friction and resistance. While you enjoy smooth throttle and shift operation with minimal friction, the system’s computer is processing and transmitting commands in real-time to actuators at the engine that deliver precise throttle control with smoother, decisive shifting. This is most evident in the low rpm range where operation is noticeably smooth and accurate. When combined with Suzuki’s Lean Burn Control System it allows control of fuel and air flow to boost the limit of the controllable revolution range improving fuel economy over a wide operating range. Suzuki Precision Control also features built-in systems that help guard the engine and drive against damage due to mishandling, and its design and simple wiring make installation easy, reducing the time required for rigging and adjustment. The Suzuki Lean Burn Control System is an intelligent fuel delivery system that achieves remarkable improvements in fuel consumption making fuel-efficient four-stroke outboards even more economical. Monitoring engine performance and operating conditions in real time, the system uses the 32-bit onboard ECM to predict fuel needs and deliver a leaner, more precise fuel mixture across the outboard’s operating range. The results show significant improvements in fuel economy across the entire powerband, including the cruising range where the engine is used a majority of the time. A key sensor in the electronic fuel injection system, the O2Sensor Feedback Control system provides accurate, real-time information that the ECU uses to manage the fuel/air ratio as operating conditions change. Utilized on many of Suzuki’s high-end outboards, the O2 Sensor Feedback Control system helps maintain optimum engine operating efficiency across the engine’s full operating range. 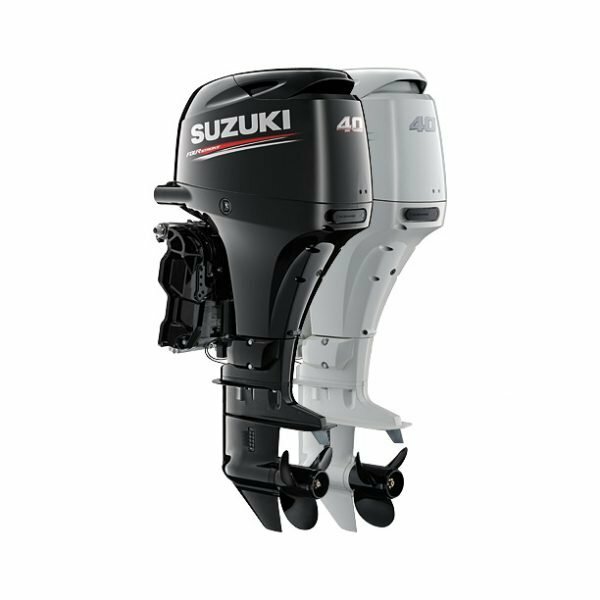 Variable Valve Timing is utilized on many of Suzuki’s high-end outboards to deliver high performance across the outboard’s full powerband while retaining the benefits that four-stroke technology provides. The system starts with an innovative cam profile designed for delivering maximum output and performance at high rpm. Variable Valve Timing is used to vary intake timing with the camshaft to optimize timing for low to mid-range operation. This allows the engine to deliver maximum power output across its entire operating range producing greater low to mid-range torque for powerful acceleration. The entire process happens automatically leaving you to enjoy the power and performance. 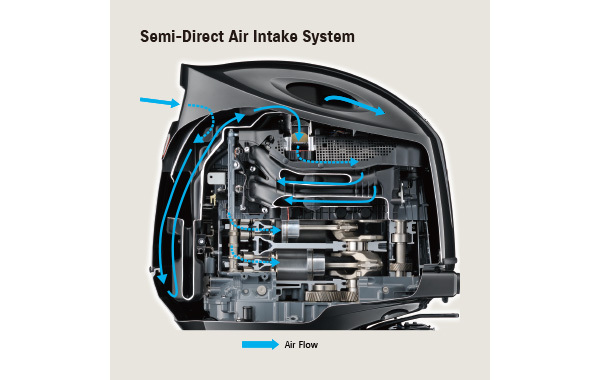 Getting the right amount of air into the cylinder has a great impact on performance. 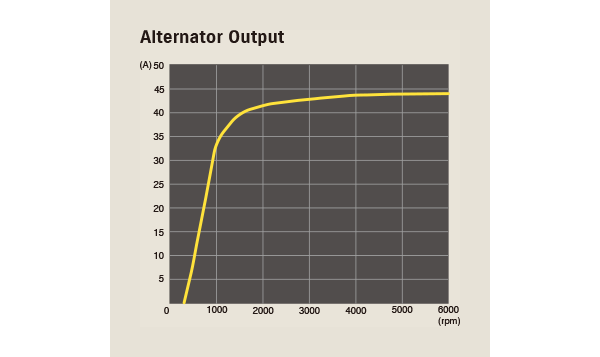 High-speed operation typically requires a greater volume of air, low-speed less. Suzuki’s Multi-Stage Induction system meets these needs by utilizing two intake manifold pipes per cylinder to ensure the engine gets the right amount of air. At low rpm, air enters the combustion chamber through a longer, curved manifold pipe designed to improve combustion and boost low-end torque. 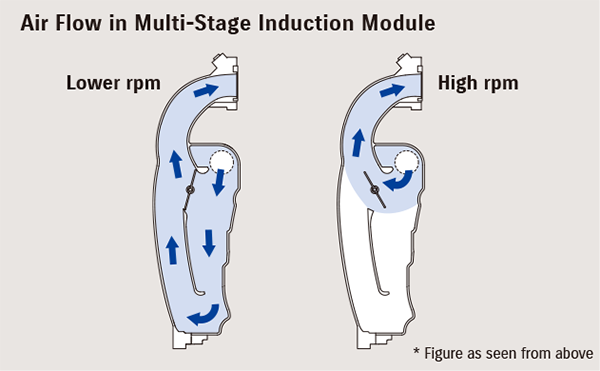 As rpm increases, the valves open on the direct intake pipes. Shorter and lacking resistance, these pipes allow a greater volume of air into the chamber, increasing the engine’s ability to breathe efficiently at high rpm resulting in higher power output during high-speed operation. One of the inherent characteristics common to in-line four-cylinder engines when operating at high rpm is a secondary vibration that is directionally in line with the piston’s movements. 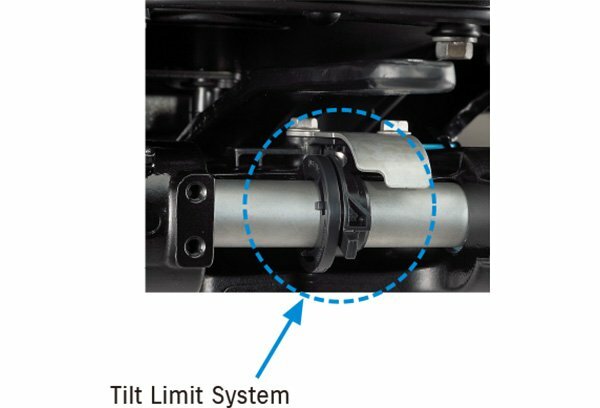 To neutralize this vibration, Suzuki engineers utilize a secondary balancer system that counters the piston’s movement with a horizontal motion. To achieve this, the balancer is divided into left and right sections each rotating in an opposite direction at twice the speed of the crankshaft, effectively countering the secondary vibrations and producing smoother engine operation. The engine’s exhaust system is a well-known source of engine noise, but another, often overlooked source is the intake manifold. Air being sucked into the intake manifold at high velocities can generate a harsh sound. The DF175AP/DF150AP incorporate an air intake resonator that reduces such noise keeping operation exceptionally quiet. 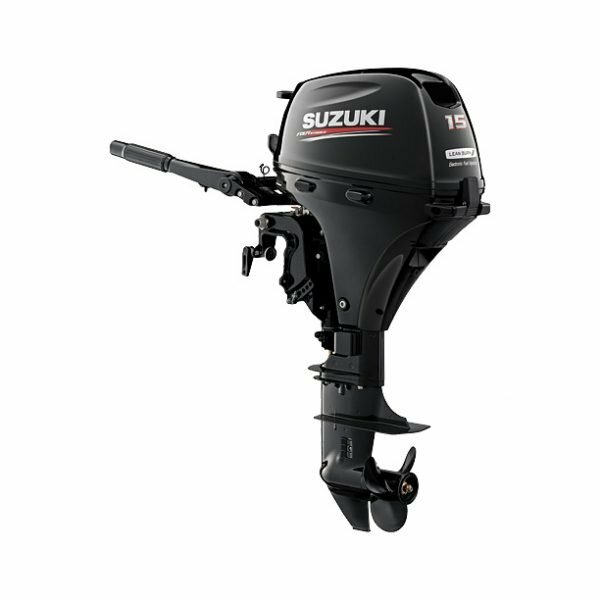 Pioneered by Suzuki, the use of the offset drive shaft on four-stroke outboards has long been utilized to reduce the size of the outboard. Found on all Suzuki four-strokes from the DF70A and up, this design positions the crankshaft in front of the drive shaft simultaneously moving the outboard’s center of gravity forward. While the design contributes greatly to the outboard’s overall compactness and increased power performance, it also moves the engine’s axis of inertia, the point where engine vibrations are at a minimum, up over the upper engine mount, thus greatly reducing vibration. 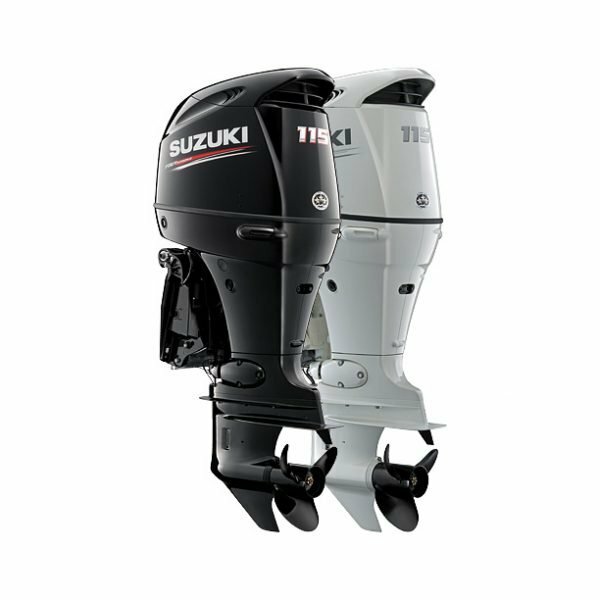 These outboards also incorporate two-stage gear reduction designed to take maximum advantage of the power produced by these high-performance engines. Providing a final drive ratio of 2.50:1—the largest you can find in either of these outboard classes—it delivers powerful torque for quick acceleration and great top-end speed. Both the DF175AP and DF150AP utilize a 32-bit ECM (Engine Control Module) that provides precision control over motor operation, particularly the ignition and fuel delivery systems. This powerful onboard computer monitors and processes key data gathered in real-time from a series of sensors placed in areas crucial to engine operation. Those sensors include the Manifold Absolute Pressure Sensor, Crankshaft Position Sensor, Intake Air Temperature Sensor, Shift Position Sensor, Throttle Position Sensor, Cylinder Wall Temperature Sensor, Camshaft Position Sensor, and Exhaust Manifold Temperature Sensor. 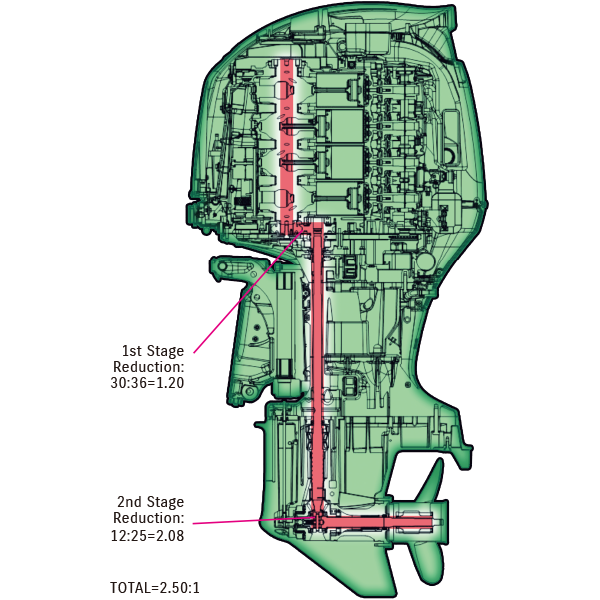 Using these data the computer delivers precision control of the engine’s ignition and fuel systems maintaining an optimal spark and fuel supply under all operating conditions. Today’s boats are equipped with a wide array of electronics that demand an ample flow of power to keep them running. With that in mind, Suzuki engineers have equipped the DF175AP and DF150AP with an alternator that produces a majority of its maximum 44A (12V) output with the motor running at a low 1,000 rpm—enough power for most circumstances. 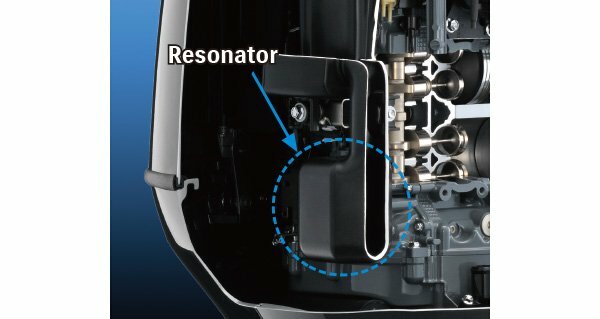 Suzuki’s Keyless Start system utilizes a proximity key-fob that transmits an access code to the engine’s starting system. As long as you have the key-fob on your person, all you need to do is stand within one meter of the console, connect the emergency switch cord, turn on the main switch then start the outboard with a push of a button. With the key remaining safely in your pocket, the system offers simple, stress-free operation while reducing the risk of a lost key. The system also makes for an excellent theft deterrent since the outboard will not start without the proper access code. The key-fob also floats so should it ever go overboard you can retrieve it. To guard against corrosion, Suzuki protects its outboards with its own specially formulated Suzuki Anti-Corrosion Finish. Applied directly to the outboard’s aluminum alloy, this finish provides maximum bonding of the finish to the aluminum surface. Layering an epoxy primer undercoat, black metallic (or white) finish, and clear acrylic fiber finish on top of this forms an effective treatment against corrosion, protecting those parts of the outboard’s aluminum alloy that are constantly exposed to saltwater.